Superior HPLC columns can be produced only with excellent packing materials and superb packing technique. SiliaChrom® columns are well known for their high efficiency and high resolution separations using extremely pure silica. Based on spherical, totally porous silica, SiliaChrom® columns provide enhanced chemical and mechanical stability as well as very high surface coverage and full end-capping as required. All SiliaChrom® columns are packed using a proprietary slurry packing process to achieve uniform and column-to-column reproducibility. The SiliaChrom® columns have good selectivity, good asymmetry and long lifetime for HPLC separation of acidic, neutral and basic organic compounds, polar or non-polar. When a column is shipped or not in use, it is always capped at both ends. Remove the end caps only when the column is to be installed on a system. 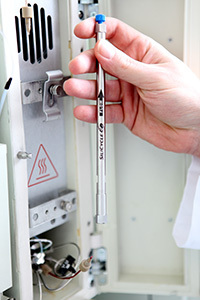 Users should always follow the flow direction as labeled on the columns when they connect them with any HPLC systems except for special purposes, such as removal of the inlet pluggage. Column connection should be done properly following the instructions. Place a male nut and a ferrule, in order, onto a 1/16" OD piece of tubing. Be certain that the wider end of the ferrule is against the nut. Press the tubing firmly into the column end fitting. Slide the nut and ferrule forward, engage the threads, and finger-tighten the nut. While continuing to press the tube firmly into the column end fitting, use a 1/4" wrench to tighten the nut 90 degrees past fingertightness. Repeat this procedure for the other end of the column. New columns are usually shipped with a mixture of one organic solvent (methanol or acetonitrile) and water. During a period of shipping and storage, the packing in the column could be dried out. It is recommended that 10-20 column volumes of organic solvents, such as methanol or acetonitrile, be purged through the column, followed by flushing the column with your mobile phase at the operational flow rate until the baseline is stable. If the column backpressure and baseline fluctuate, this might be due to the air bubbles trapped inside the column or the flow cell. Flush the column with organic solvent at higher flow rate for 2-5 minutes, for example 2mL/min for 4.6x150mm; or increase the pack pressure at the outlet of the flow cell using a backpressure regulator. SiliaChrom® columns are normally operated under high pressure. Any loose connections will cause leaking of organic solvents and the injected samples, which should be considered as hazards. In the case of leaking, proper gloves should be worn for handling the leaks. Opening columns by users is not recommended. When opening a column, proper protections should be used to avoid inhalation of the small silica particles. To avoid clogging the column, all samples and mobile phases should be filtered through 0.45µm or 0.20µm filters before use. It is recommended that the mobile phase contains at least 5% organic solvents such as methanol, acetonitrile. The mobile phase should always be degassed before use. A simple way for degassing is to sonicate the solution for 5 minutes under slight vacuum. Avoid use of SiliaChrom® XT C18 Fidelity below pH 1.0 or above 12.0*. Higher pH will dissolve silica, causing separation efficiency loss and retention time change. The optimum performance and operation for longest lifetime are at pH 2.0 - 8.5. Although SiliaChrom® columns can tolerate pressure up to 400 bar, the normal operation should be under 250 bar. Continuous use at extreme pressure may eventually damage the column and the pump. It is expected that the column backpressure might slightly increase following a certain period of use. A sudden increase in backpressure suggests that the column inlet frit might be plugged. In this case it is recommended that the column be flushed with reverse flow in an appropriate solvent (high aqueous in many cases). The maximum operating temperature is 60°C. Continuous use of the column at an elevated temperature (>45°C) can reduce the lifetime of the column, especially under high pH (>8). When not in use for extended time, do not allow high aqueous or high salt mobile phase to remain in the column. Remove aqueous buffers remained in the column by washing it with 20-30 column volumes of 50% methanol or acetonitrile aqueous solution, followed by 20-30 column volumes of organic solvent such as methanol or acetonitrile. Each column is shipped with two removable end caps to prevent the drying of the column bed. Cap both ends when the column is not in use. * When pH<9, it is recommended to avoid use of phosphate salts, such as sodium or potassium phosphate. Use an organic amine or ammonia for pH adjustment to extend the life of the column and to suit the requirement for MS detection.